I've made a lot of lovely dresses recently, however, for my next project I wanted to give something a bit different ago. I therefore decided on some pajamas! I say pajamas, as that is what the pattern is stated as being however, I like to think of these as my day time 'lounge suit', to be worn casually but most fabulously around ones home. I was inspired by the Mandarin collared suits from which I initially thought became popular in the Western world during the 1950s but after doing some research I discovered that they seemed to have been commonplace since the 1920s. Loose fitting and often made from crepe or silk type materials they always look so effortlessly smart and stylish. I searched around for a good pattern and struck gold with Butterick 4406 which replicated this look really closely! The loop button fastening and Mandarin collar reflected the style I wanted perfectly. For my fabric choice I opted for a summery, floral cotton poplin which will be really wearable and easily washable for maximum wearability - I want to be in this suit every weekend until next winter comes around! The colour of my fabric is a beautiful shade of yellow and the floral print is made up of a lovely mix of pinks, reds and greens. This fabric comes in a couple of different colourways and I'm already planning a summer dress in the grey\pink combo. This pattern is a 'fast and easy' from Butterick and I can confirm that it certainly is that! I had this whipped up within a few hours, including tea breaks. The trousers are just two pattern pieces - front and back. The waist band is 'in built' and just requires you to fold down the top to encase the elastic - couldn't be simpler! The pattern instructs you to neaten and top stitch the hem of the trousers but I love turn up cuffs so I created these at the bottom instead. If you want to do this too, just remember to leave enough length when cutting your fabric to be able to do so. Moving swiftly onto my jacket, it came together really quickly again as it is so straightforward to construct. I added my button hole loops first using the placing on the pattern pieces, then added the facing and collar. The Mandarin collar is so chic, I love the aura it gives the suit, like it means business compared to a standard lapel! I altered the sleeves slightly from the pattern too. I changed them from full length to three quarter length sleeves, because although I didn't want short sleeves, I knew I would end up rolling the end of long ones which would be pointless. I love the look of the length now and think the balance is right with the size of the top too - where the top itself is quite wide I didn't want the sleeves to look small in proportion. I created a turn up at the bottom of the sleeve too, to match the trousers. With both turn ups, I catch stitched the turn up from the inside so that it doesn't work it's way down when wearing/washing. One of my favourite features of this set is the Mandarin collar. I've always liked them in men's clothing but haven't ever included one in something I've sewn for myself - until now! It was straight forward to construct, although I had to do some major clipping in the seam allowance so that it could sit flat. I also love the button fastening on the top. It's such a simple technique but I always think button loops look so couture! I chose white pearly buttons, to compliment my fabric. If you were to go any smaller than the buttons I used, I would suggest adding another one or two more (so 6 or 7 total) because you might find it a little 'gapey' in between fastenings otherwise. Overall, I really enjoyed sewing this pattern and know these lounge PJs are going to get loads of wear. 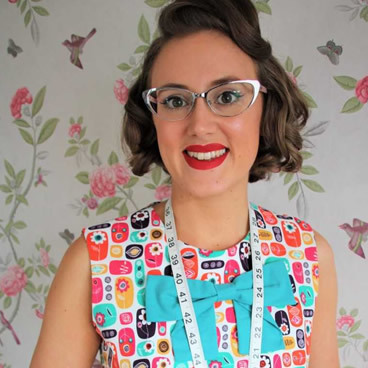 Sometimes you just need to refresh your sewjo by whipping up a lovely but simple project! I would definitely recommend this pattern, and if your spring wardrobe is feeling a bit lacking then I strongly suggest this sunny, floral fabric to you!